With so much to see inside the many halls and corridors of Messe Düsseldorf, here’s editor Dave Gray’s guide to everything you’ll need at this year’s Compamed. Every year Messe Düsseldorf and the IVAM Microtechnology Network team up at a spring convention to forecast key trends for the event. This year the conversation was dominated by talk of new and futuristic implants. Researchers from the International Trade Administration and BCC Research have valued the sales volume of medical implants at €30-60 billion, of which ‘active’ implants constitute around €15 billion. ‘Active’ refers to any implant that is fitted with an energy supply, typically a battery. New materials, innovative procedures and the combined application of electronics and microsystem technology are set to be fundamental themes at Compamed this year. Giesen added: “Providers are turning to suppliers to seek ever more delicate, lighter and at the same time more advanced components such as sensors, chips, wireless modules and even accompanying energy savers or information savers. While miniaturisation and digital tech are both key trends expected at Compamed this year, more conventional materials are also set to feature. German chemical giant Henkel, for example, will be showing a new collection of products including LED curing adhesives for flexible medical devices, a range of advanced pressure sensitive adhesives for plasters and functional patches as well as conductive inks for smart health devices. While these new materials may only really be new iterations of existing technologies, Henkel also believes that new trends are changing the game. The firm says that the spotlight will be on new acrylic adhesives developed for use on flexible applications made of thermoplastic elastomers (TPE) and thermoplastic polyurethanes (TPU), two substrates increasingly specified by device manufacturers. As low-viscosity, LED curable and high-flexibility adhesives, they feature tack-free curing and combine high elongation (>200%) with outstanding bond strength also on polycarbonate, acrylic and other rigid plastics used in medical devices. “Using LED curing saves costs, thanks to the fact that it can be switched on/off instantly. Additionally, the narrow spectrum of light wavelength without infrared light emissions helps manufacturers save energy consumption and minimises the generation of heat that must be dissipated, especially in cleanroom bonding applications,” said Andrés Bultó, business development and key account manager, medical at Henkel. “When developing our new LED cure adhesives, our aim was to add further value by enhancing their flexibility and design freedom, while at the same time maximising their bonding strength. Notably, the property profile includes fast LED curing in all geometries, from bondlines to open fillets,” he added. As discussed, implants have seen a trend towards ‘active’ technologies, but woundcare is also moving in a similar direction. Reflecting this trend, Henkel is also presenting its new hydrocolloid hot-melt pressure sensitive adhesive. 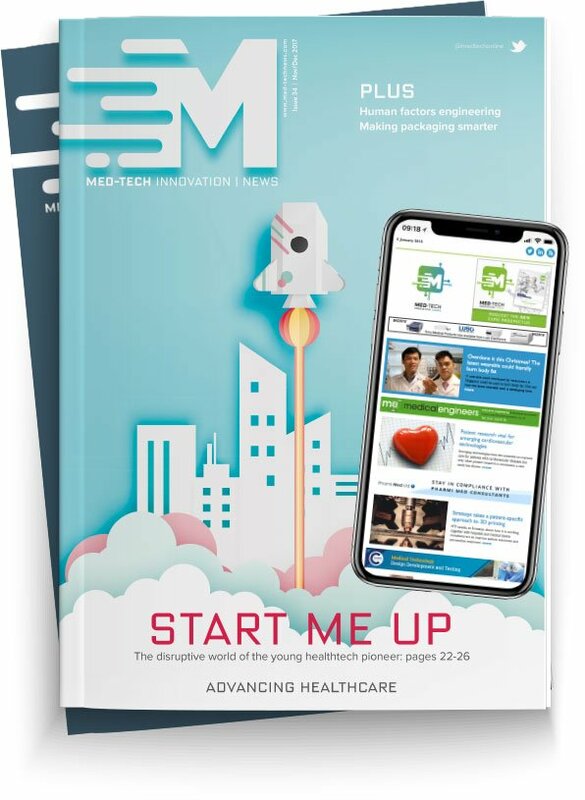 This innovation targets the fast-growing demand for functional medical plasters and advanced patches for use in applications such as advanced wound dressings, acne treatment and ostomy care. If digital health is more your thing, there’s plenty of cutting-edge tech on display at Medica, but what about the tech behind the tech? Henkel says this year it is targetting smart health devices, such as disposable moisture sensors for incontinence management and comfortable on-body health patches for real-time wireless patient monitoring using novel dry-electrode materials. While many players like Henkel will be pushing new product lines at Compamed, others will have other developments to share. Materials group Eastman, for example, has opened a brand new European Technology Center in Ghent, Belgium in the time since the last edition of the show. Device manufacturers can use the show as an opportunity to find out what’s on offer at the new facility. In a sneak preview, Eastman revealed that the facility is based at Ghent University's technology park, and its staff work with customers from design conception to implementation, as well as helping to address production challenges as quickly as possible. Onsite medical plastics experts are also working closely with Eastman’s other R&D centres across to globe to accelerate the development of future-forward technologies, including performance compound technology and bio-based alternatives, the firm said. "We offer the right plastic now, to enable customers in the medical sector to succeed today. We are also continuously investing in more sustainable business solutions that will help them perform tomorrow. Innovation lies at the heart of our offering," said Cedric Perben, Eastman Technology. Another firm with news of an expansion (or, rather, multiple expansions) is Carclo Technical Plastics. Carclo has recently expanded its medical operations in its US, UK, Czech Republic, China and India facilities as it continues its strategy of increasing its contract manufacturing business globally. Underpinned by its EN13485 accreditation, the firm says it has won significant new business in the healthcare, medical diagnostics and eyecare fields during 2017/18, and will be planning on sharing its new capabilities with visitors to the show. 3D printing remains a hot topic at Compamed. According to a forecast by market research company Markets and Markets, global 3D printing for medical products is expected to increase from 840 million US dollars in 2017 to around 1.9 billion dollars by 2022, a yearly growth rate of 17.5%. Last year, Compamed’s seminar “3D fab+print” went down a storm. For 2018, it will be followed up with an all-day conference on the subject – possibly Messe Düsseldorf’s most significant foray into the field. Among the companies presenting is Evonik, which has been systematically working on improved materials for orthopaedic surgery in their project house Medical Devices since 2014. “We are developing new solutions that help prevent operations or accelerate the healing process,” said project house manager Balaji Prabhu. Evonik is well-placed to talk on the subject, having been responsible for developing a composite that consists of the polylactic acid ‘Resomer’, and a synthetic hydroxylapatite filler. Hydroxylapatite is the most common bio-mineral in the human body, resulting in mechanical characteristics that are very similar to those of natural bones. Resomer is completely degraded into carbon dioxide and water in the body, does not cause inflammatory reactions and is completely non-toxic.